A veneer is a thin layer of tooth coloured material which is placed over your natural tooth to mask the underlying enamel. It is custom-made to fit exactly over the tooth, a little like a false finger nail. Closing or minimising Diastemas – spaces between your teeth. Hiding small chips or worn areas in teeth. Some people may choose to only have one or two veneers to help perfect their smile, while others will choose to have multiple veneers covering up all the teeth visible whenever they smile or talk, in which case we may be able to make them in a slightly lighter shade than your natural teeth. This treatment can also be used in conjunction with other cosmetic dental procedures, for example teeth whitening and dental bonding, or to provide that finishing touch after orthodontic treatment. This procedure is usually completed in two visits and it is a simple and relatively quick route to improve your smile. The first part of the procedure involves our dentist removing a small amount of enamel from the front of your tooth and the veneers are fitted during your second appointment. Each veneer is individually handcrafted by our dental technician to create a healthy and natural appearance. An initial consultation is required so you can discuss your aims and desires with our dentist. After examining your teeth, they can chat to you about dental veneers and how they may help your smile. If you intend to have multiple veneers then it’s likely we will have a ‘diagnostic wax up’ made of your teeth to show how your teeth will look with veneers. This is a very simple procedure as our dentist will take impressions (mould) of your teeth and these will then be sent to the laboratory. 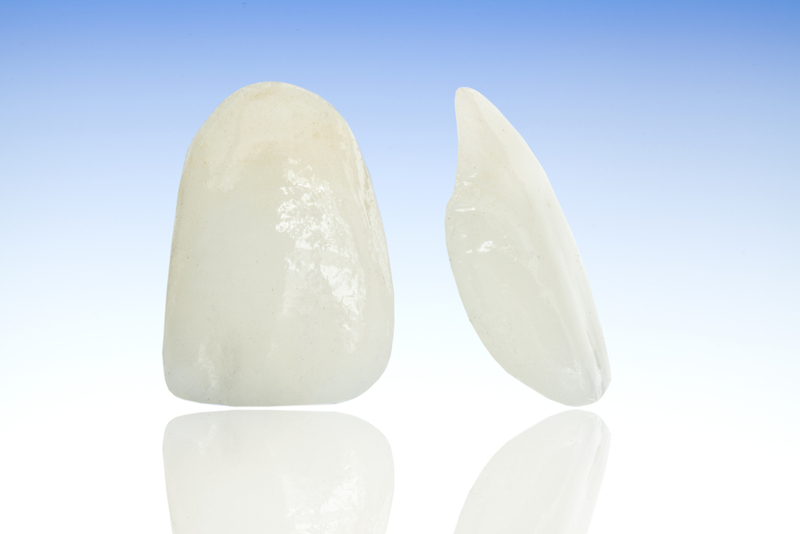 Our technician will make a cast of your teeth using the supplied impressions (moulds). Tooth coloured dental wax is then applied to the cast, to show how the final veneers will look. A diagnostic wax up can be extremely helpful, as any adjustments are easily made to the wax until you are happy with their appearance. This diagnostic wax up may also be used to construct your temporary veneers that will be worn while your new veneers are being made, allowing you to “trial” your new smile before it becomes permanent. If you decide that veneers are for you, two appointments will be needed. The first appointment is for our dentist to prepare your teeth and then a second is required to fit the veneers. Local anaesthetic is used to keep you comfortable while your teeth are being prepared. A small amount of tooth is removed from the front surface of your tooth to make room for the veneers. The amount removed is tiny as veneers are typically 0.5 mm in thickness. An impression (mould) is taken of your teeth using special silicon-based impression material that will reproduce your teeth in great detail. The impression material is placed into an impression tray which is then inserted into your mouth. Once the impression material is set the impression tray will be removed. An impression is also taken of your opposing teeth, so the technician can see how you bite together. Temporary veneers will be fitted to protect your teeth whilst your veneers are being fabricated. Your temporary veneers will be removed and any remaining cement is cleaned off your teeth. Your new veneers will be temporarily placed using a special paste which will allow our dentist to make any adjustments that are required and to make sure that you are happy with the appearance. The veneers will then be removed and the tooth surface prepared for the dental adhesive. Your veneers will be permanently cemented in place to create the beautiful smile you have been waiting for. Veneers can last a long time but a lot depends on how you take care of them. You must maintain good oral hygiene, brushing and flossing twice a day and regular dental examinations and cleanings are vital.